From Here to There explores the relationship between home and work. 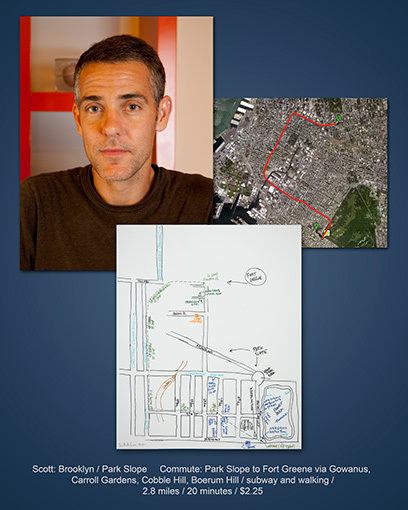 This project is composed of several parts: 360˚ panoramic documentation of a worker’s living room juxtaposed with their office; workers’ commute maps drawn from memory; commuter’s verbal descriptions of their commutes, focusing on their ‘psychogeographic’ perceptions; a smartphone app that enables the comparison between one’s perceptions of the demographics of their surroundings with statistical analysis of that area. As with much of my art, this piece is an interdisciplinary exploration of areas such as economics, urban studies, mass transit, sociology, using photography, video, and new media to express the content. Sources for inspiration include artists such as Guy Debord, Hans Haacke, Martha Rosler, Gordon Matta-Clark, and theorists such as Henri Lefebvre, David Harvey and David Morley. As this project synthesizes connections between disciplines not traditionally considered to be art, it challenges the viewer to reconsider what art can be. Scroll down to see examples of the panoramic documentation and video. This work is in progress and evolving as I go. I welcome the participation of those interested, whether being a subject for documentation, or a creator who shares my curiosity in these areas. Please email me via Contact above.